Many stars of the sheep-herding world will be present during the National Point Qualifying Sheepdog Trials, taking place during the Trailing of the Sheep Festival this year. The competition takes place Saturday, Oct. 13, and Sunday, Oct. 14, at Quigley Ranch east of Hailey. For thousands of years “man’s best friend” has been employed by herding cultures, as both guard dogs and herding companions. Hailey will play host to about 50 herding dogs and their masters in Quigley Canyon this weekend. The duos will demonstrate the remarkable abilities of man and animal to keep the wool where it ought to be. The event is a must-see for all animal enthusiasts who have wondered who is in charge of the sheep and how the dogs are trained to respond to their handlers. The governing body of the U.S. Border Collie Handlers Association sanctions the Trailing of the Sheep Festival Dog Trials. This year’s competition includes five top-ranked dogs and their handlers. Current top duo in sheep trials is Riggs and his trainer, Patrick Shannahan, who have been a team now for almost a decade. They have competed in Hailey for several years and grown accustomed, as some have not, to working with the “wild” sheep used at Trailing of the Sheep. They are called “wild” because they spend summers in the wilderness. Riggs was the 2005 National Reserve Nursery Champion and the 2010 USBCHA national champion. This year, Riggs has won trials at the Dirt Blowing Trial in Dayton, Wash., Palm Cottage Trial in Cottage Grove, Ore., Vashon Stock Dog Classic on Vashon Island, Wash., and the Jim Bridger FFA trial in Wyoming. “Riggs turned 10 in August and is having one of the best years of his career,” Crofts said. A sheepdog trial begins with the handler and dog at one end of the trial course facing five range sheep at a distance of 450 yards. Each dog begins with a total of 100 points and the judges deduct points as the dog negotiates each step. The steps must be completed in sequential order. Each dog has 12 minutes to complete the course. Step1) OUTRUN–20 points. 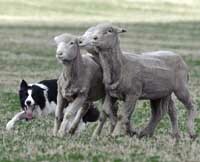 The handler releases the dog to run in a pear shape around the sheep without “spooking” or startling them. The distance can be up to 600 yards. The dog then begins the lift. Step 2) THE LIFT–10 points. This is where the dog “introduces” itself to the sheep and slowly begins to move them forward. Step 3) THE FETCH–20 points. Here the dog brings all five sheep to the handler waiting at the end of the field. The first part of the fetch is to bring the sheep 200 yards and through two parallel “fetch” gates. Once through the gates, they will travel another 250 yards to and around the handler clockwise. Step 4) THE DRIVE–30 points. Broken into three parts. In the first part, the sheep are herded 150 yards towards and through the first “drive” gate. In the second part, called the “cross-drive,” the sheep must cross the entire field, an additional 150 yards, and go through the second “drive” gate. The third part is the drive to the shedding ring. Step 5) THE SHEDDING RING–10 points. When all five sheep are in the shedding ring, which is 40 yards in diameter and marked only by a circle on the ground, the team must then “shed” or separate the back two sheep from the other three. The judge usually calls “good” and the sheep are then regathered in the ring and head for the pen. Step 6) THE PEN–10 points. Once all five sheep are back in the ring, the handler will walk to the pen and open the gate. The dog will then attempt to herd the sheep to the pen. The sheep have never been worked in groups of five before, so this can be very difficult. The handler can assist the dog, but once his/her hand is on the rope of the gate, that is where the sheep have to stay. Once the sheep are in the pen, the trial is complete.